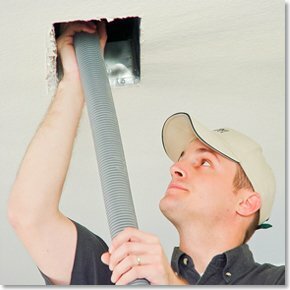 When was the last time you cleaned your building’s air duct system? Whether you maintain a retail establishment, hospital, school, sports arena or government building, the state of your facility’s air conditioning and heating system will greatly affect the overall air quality. Over time, air ducts can attract and build up soot, mold, mildew and other contaminants, which then become airborne whenever the system is used. For professional air duct cleaning, Atlanta homeowners have relied on KIWI Services, and we provide the same premiere services for our commercial customers. We have 30 years of expertise with cleaning air ducts in the Atlanta area. Don’t trust crucial air duct cleaning to a general maintenance crew. Our KIWI technicians are highly skilled in working with all kinds of HVAC systems. They are fully licensed, bonded and insured for your peace of mind. We employ an extremely thorough air duct cleaning process for residences and commercial properties. If your company’s heating and cooling system is many years old, it is especially important to have Kiwi’s professional duct cleaning done as soon as possible. Unhealthy interior air directly results from the presence of moisture in your system. When an environment is damp, dirt and debris gets trapped in your air ducts, which then leads to mold growth. This can even be caused with seasonal temperature fluctuations. Stop mold spores in their tracks with KIWI and keep the air ducts in your work environment clean and safe. Our technicians are trained to provide full air duct cleaning service, and will evaluate your system to determine the best cleaning method. They will use antimicrobial treatments to prevent future mold and bacteria growth. This service is guaranteed for 2 years after your initial service. Call us now at 470-375-9710 to schedule an appointment.